Hi there! If you can remember very well, some posts on Akademia have addressed various ‘types of…’ posts. We have looked at types of clauses, types of sentences, phobia types, types of verbs, types of nouns, morpheme types, types of adverbs, etc. 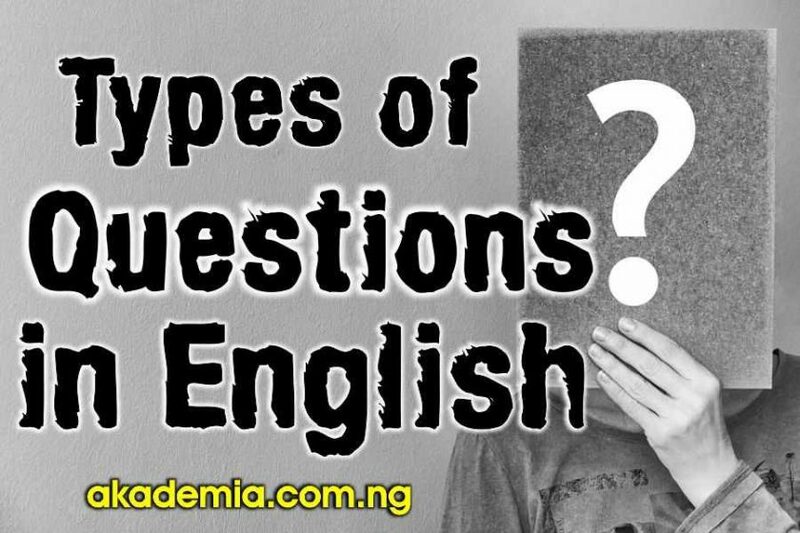 But in this post, we want to examine yet another ‘types of post’ and I call it Types of Questions in English with Definition and Examples. Did I hear you say ‘interesting’? Then I say ‘Touche’! So let’s get to it. Have you ever thought of this question? It is obvious that you make use of the word ‘question’ almost on a daily basis; but you have not really asked the question, what is a question? Okay, let us answer the question. A question is a type of clause or sentence which has an information gap that needs to be filled. For instance, where did you do the festival? The information gap here is the place where the festival held. So, in essence, a question seeks or requests information from another individual. This question is so called because it deals with polarity. Polarity simply has to do with the opposition between positive and negative. A polar question is a type of question that elicits a two-way answer – positive or negative. It either gives the answer ‘yes; or ‘no’; hence the name, ‘yes/no question’. What did you see in the house? How were you able to get the visa? Where is the money you withdrew from the bank? Another name for wh-questions in English is content questions. I have dedicated a special post to this type of question. You need to read it. I tilted it Wh Questions with Definition, Types and Examples. It is a must read; do check it out. Do you want to be a slave to your mates? Do birds fly and do fishes swim? Is six and half a dozen the same? Do you think the Pope is Catholic? Can’ you say that again? Don’t you want to fulfil purpose? Are we going to continue like this? Is this the way we will be indifferent I this matter? Are ants attracted to sugar? Shouldn’t you concentrate of making a living out of your life? Shall we continue in sin and say grace should abound? Who knows what she can do? How long will corruption hold sway in this nation? Can I ever love you less? I am not a mind reader, am I? For how long will I put up with your incompetence? But in it all who really cares? Who cares whose ox is gored? What’s the problem with being sincere? What do we even labour for? Why do you bother yourself on what you have no power over? What is even wrong with the world? Can’t I sleep again in peace in my own house? What more can I say to thank you? Do you think I am a baby? Do you think I just came from nowhere? Was I born yesterday that you would talk to me like that? We can use it in persuasion. Writers use it to sustain readers’ interest. A direct question is a type of question the ends with a question mark. It is so called because it is not a question that comes indirectly; it is clear that it is a question that cannot be mistaken for a statement or sentence when someone asks you because it comes directly as a question. An example of this can take any form of the questions we have discussed here. An alternative question is a type that provides choice or alternatives; it presents two or more possible answers presupposing that only one is true and that is why its name derives from it. In asking an alternative question, the speaker offers the hearer a closed choice between two or more alternative possibilities. The word ‘or’ signals the relation between the alternatives. Will you take Coke or Fanta? Shall we buy candies or buy ice cream? Would they prefer going by bus or going by air? Should we go to the cinemas or go back home? Is the baby male or female? Would you like rice, porridge, or yam? Would you like orange, apple or cucumber? They asked her whether/if the baby was male or female. Anne wondered whether/if he was waving or drowning. This is another type of question in English that is worth considering. It is a question that has a tag with it whenever anyone asks it. Because of the loads of information on tag questions, I have also devoted a whole post titled, Tag Questions in English: Formation, Rules, Types and Examples. It is quite important that you take a look at it. What a cheat he was! Why didn’t you call me all these while? Wouldn’t it be nice if Nigeria became the envy of other nations? Weren’t we all here when the enemy infiltrated our camps? What other dungeon is so dark as one’s own heart! What jailer so inexorable as one’s self! How on earth did you break in here! This type of question is similar, in a way, to polar or yes/no question; but it has a declarative form and comes with a rising tune at the end. In other words, a declarative question comes in the form of a statement but it is a question and has the question mark at the end. You are asking me to leave your office? You did not consider calling me before leaving? The accused has escaped from custody? The principal called my name on the assembly? She took my car away? You could not do anything to stop him? Our candidate will be disqualified? He did this to you? It escaped from its cage? He’ll miss the party then? She lied to the commission of enquiry? Like us on Facebook and invite your friends to do same. You can also share this post and other educative ones with your friends.